It is still not clear to me what you mean, you mean that the roller does not roll smoothly? Or that the needles do not penetrate easily? It is not easy to see on the photos but you appear to have some enlarged pores and some scars. You can try a 0.2 mm regular dermaroller for the overall skin texture and a 1 mm dermastamp for scars. Dermarolling is very effective for scars but unfortunately not very effective for pores. Pores are ducts in the skin and there is currently no method that can reliably and permanently reduce their size. Very few of our customers managed to reduce pore size with dermarolling. Thank you very much, Peggotty, for your feedback. Dermarolling works, but just like with any other method, in some individuals it doesn't achieve (major) results. I appreciate that you took the time to tell us about your success! If you think there is something wrong with your roller, the forum is not the right place to complain - and our forum rules say: "Please no product complaints" and we have a good reason for that - explained in the forum rules. Instead, email us a picture of your roller, so that we can see whether you have received a bad roller. That does happen occasionally, that is why we advise to inspect the roller before use and when in doubt, to email us. I did not understand what you meant by "the plastic touches the skin before the needles"? 90 % of the customers who got bruising after single needling (there were not many), got them after needling the stretch marks on the upper arms. This area seems to have very thin skin and it is perhaps better to use a 1.5 mm dermastamp, because the single needle goes even deeper. It is an OTC cream containing heparin. Do not apply it right after dermarolling or needling. You can start applying a day after. Yes you can use a toothbrush, but the discoloration caused by the blood is nothing to worry about because it's a molecularly thin layer of "paint" made of the hemoglobin in the blood. Since Hemoglobin is an iron compound, it can react with steel and discolor it. The discoloration does not mean there is bacterial contamination. If there is some blood visible on the plastic then using a toothbrush is a good idea. Dermarolling / Microneedling / Re: Does anyone have any good news regarding their stretch marks? There have been many forum postings on our forum about stretch marks improvement. 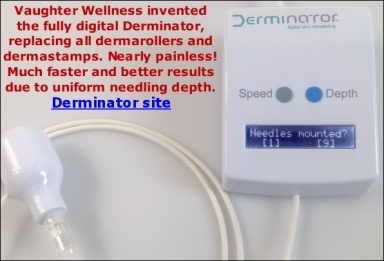 Dermarolling / Microneedling / Re: How useful is the 1 mm dermaroller? I believe a 1 mm dermastamp is more suitable for the area around the eyes because the skin is quite thin there. You can use your 1.5 mm dermastamp on your forehead (the sides of the forehead are also quite thin though). you use Botox). They will fill in and become less visible but they will still be slightly visible. instead of the single needle, if you prefer. Yes, you can use the one liner and especially the single needle while the skin is still darker from the regular rolling. Dermarolling / Microneedling / Re: How deep should I go and how do I know? Single-needling or dermastamping a tummy tuck scar is a very good idea and there is a good chance the scar will improve. In this case, a 1.5 mm dermastamp with 35 needles is perhaps a better option than the single needle because a tummy tuck scar is usually quite wide. You should needle to a depth where you get occasional pinpoint bleeding. Right after stamping, apply our 0.1% Tretinoin cream and on top of that, apply something very moisturizing (for example our Infadolan ointment or some good quality oil). You should try a 1 mm dermastamp and stamp the hypopigmented area every ten days. There is a good chance it will improve. Fist try the dermastamp somewhere else on the face (on the side) to see how your skin reacts to it. It should be OK but it is always good to do a test patch. After stamping, there maybe some hyperpigmentation that will soon disappear. The area above and around the lips is very sensitive and you may need a numbing cream. We made a new design of our single needles; unfortunately they will take a long time to be produced. The needle itself will be the same (strong but very thin with long taper) but the handle is going to be thicker and easier to use. No, do not seek a professional dermarolling treatment. You can do exactly the same at home and much cheaper. Dermarolling / Microneedling / Re: Are non-natural serums or creams (vit. C or vit. A) dangerous for our system? Perhaps I am preaching to the choir but there is another popular misconception concerning "natural" versus "chemical". Every substance in the universe is a chemical. Which includes all natural products. Water is a chemical, we are 100% made of chemicals, everything on Earth is comprised of chemicals. A chemical-free product does not exist. Natural products can be great but do not believe that if something is natural, it is automatically good and harmless. Some of the most toxic substances are natural - botulinum toxin, uranium, curare etc. Rotten meat, moldy bread and excrement are also natural. Toxicity is all in the dose. Even natural products that are not considered toxic are harmful in larger quantities. If you drink more than a few liters of water in one go, you will die of water poisoning (electrolyte imbalance). Stating that something has no side effects because it is natural is a logical fallacy, and the same with saying that something is harmful because it is "produces in a laboratory". Vitamins are also naturally produced - in fruits, plants or animal products. If you produce them in a laboratory, they are 100% identical to the "natural" vitamins. There is absolutely no difference. What can make a difference is that in food for example, there are often multiple vitamins , minerals and trace elements and such complex can enhance each other's absorptions (for example iron and vit. C). Unfortunately, this planet has so many people that in order to feed them all, the soil is extensively overused and depleted of miners that should normally be present there. It would be great to get all your vitamins, minerals, and trace elements from the food but it is not very realistic in the current world. Our Tretinoin cream should not be used in pregnancy or breastfeeding in conjunction with dermarolling as it is stated everywhere on our website and in the instructions. It is due to its content of vit. A, which is very important to get in pregnancy but care has to be taken not to overdose. In any case, whether natural or not, you have to be very careful in pregnancy and breastfeeding with everything. My personal opinion on vit. A used on open skin in pregnancy is that even that is safe (due to the enormous doses required to induce toxicity, such doses simply are unattainable that way), but opinions sometimes turn out to be wrong, hence the precaution. Yes, you can do weekly mild stampings, no problem. The redness after deep, dense stamping can indeed last for days but it is individual and it varies amongst people. The suction method can even cause bruises so if you ever try it, do it on Friday evening and on a very small area.